Linford Footbridge No 76B is a minor waterways place minor waterways place place on the waterways major waterways place village town city on the Grand Union Canal (Grand Junction Canal - Main Line - Gayton to Brentford) between Great Linford Railway Bridge No 76A (disused) (3¾ furlongs to the west) and Bridge No 78B (Grand Junction Canal) (5¾ furlongs to the southeast). The nearest place in the direction of Great Linford Railway Bridge No 76A (disused) is Linford Winding Hole; ¼ furlongs away. 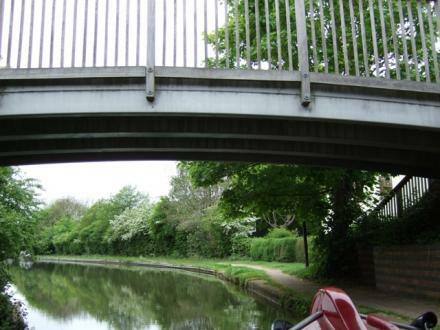 The nearest place in the direction of Bridge No 78B (Grand Junction Canal) is Linford Wharf Bridge No 77 (Great Linford, former junction with the Newport Pagnell Canal); a few yards away. M1 Motorway Southbound, Junction 1415 Newport Pagnell, Welcome Break, Newport Pagnell, MK16 8DS — 1168 yards to the northeast. Btw Jct 14 & 15, M1, Newport Pagnell, MK16 8DS — 1239 yards to the northeast. 13 Ormande Stantonbury, Milton Keynes, MK14 — 1484 yards to the south. Milton Keynes — 1012 yards to the east. Milton Keynes — 1294 yards to the west. 6 Clayton gate, Giffard park, Milton Keynes, MK14 5HN — 1159 yards to the southeast. Great Linford, Milton Keynes, MK14 5DU — 1171 yards to the south. Unit 48, Tanners Drive, Blakelands,, Milton Keynes, MK14 5BW — 1119 yards to the east. Milton Keynes — 1556 yards to the northeast. Lower Stonehayes,Great Linford, Milton Keynes — 1254 yards to the south. Newport Pagnell — 1626 yards to the northeast. Newport Pagnell — 1608 yards to the north. Newport Pagnell — 1375 yards to the northeast. 10 Tanners Drive, Milton Keynes, MK14 5BW — 959 yards to the northeast. Milton Keynes, MK14 5PT — 1357 yards to the southeast. Milton Keynes — 1386 yards to the south. Milton Keynes — 691 yards to the south. M1 Northbound Services, Newport Pagnell, MK16 8DS — 1095 yards to the northeast. Giffard Park, Milton Keynes, MK14 — 209 yards to the east. 1590 yards to the east. Milton Keynes — 1054 yards to the east. 11 Hill View Wolverton Road, Newport Pagnell, MK168BE — 1463 yards to the northeast. Milton Keynes — 1587 yards to the southeast. 22 cypress Newport Pagnell, Milton Keynes, MK160LB — 1375 yards to the northeast. Great Linford — 1012 yards to the southwest. Milton Keynes — 1508 yards to the northeast. Horton Gate, Milton Keynes, MK14 5JG — 587 yards to the northeast. Wolverton Road, Great Linford, MK14 5AH — 646 yards to the west. Pipard, Milton Keynes, MK14 5DF — 1159 yards to the south. 22 Tower Drive, Neath Hill, Milton Keynes, MK14 6HY — 1589 yards to the south. Milton Keynes — 932 yards to the east. M1 Northbound, Milton Keynes, MK16 8DS — 1202 yards to the northeast. The Grove, Newport Pagnell, Milton Keynes, MK16 0BJ — 1625 yards to the northeast. Parklands, Milton Keynes, MK14 5DZ — 436 yards to the southwest. 1607 yards to the southwest. 4 Quatro Park, Tanners Drive, Milton Keynes, MK14 5FJ — 871 yards to the east. Milton Keynes — 630 yards to the southwest. 1191 yards to the east.